Although there are many names associated with a cord of wood, the legal definition of a cord of firewood in the US and Canada is a full or bush cord, which typically measures 4' wide x 4' high x 8' long and is 128 cubic feet in volume. Other names not defined by statutes for a stack of firewood are a face or rick cord which often refers to a stack of wood 4' high x 8' long and on the average about 16" wide, or the size of the firewood pieces. So in effect, a face or rick cord is usually smaller than a full or bush cord. 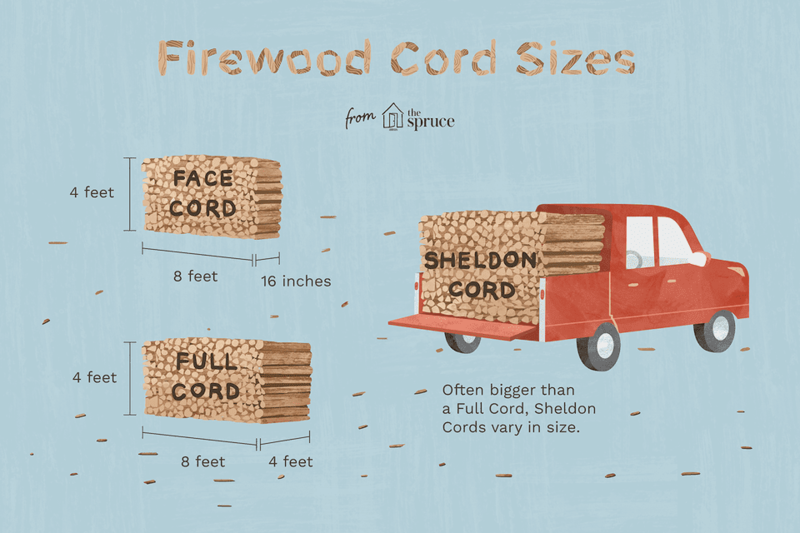 Another wood stack measure is a Sheldon cord, which varies in size and is often bigger than a full cord. Some sellers will also refer to their firewood by pick-up load, so the objective here is for the buyer to know what they are paying for. Since the name given to a cord of wood can vary and also be confusing for both the buyer and the seller, it's always smart when buying firewood, to confirm the stack size or amount of firewood you are buying. That will make it easier when comparing between different firewood sellers to get the best deal. So now that you've bought and paid for your cord or cords of firewood and it's been dumped in your yard, (on a large tarp to save cleanup), what do you do with it? If you purchased it split and dried, all you have to do is stack it in a convenient spot, where you can get at it all winter long, preferably under cover of some sort. If your firewood is green or wet and not split, you have a little more work to do. First, split it into manageable pieces both for carrying and burning in your woodburning appliance. Now find a fairly open airspace to stack it for air drying. How fast and efficiently the drying process is, depends entirely on which method you choose to stack or pile your wood, and remembering to start stacking off the ground, either on logs, bricks or pallets. The most practical, popular and common method is to row stack it with either stakes at the ends or by cross tying. Here's a hint for easy and foolproof cross tying. While you are splitting your wood, try to split a whole mess of square pieces, this will make your (stacking) ends much stronger than if using half round or odd shaped pieces. In the long run, this saves time and effort. Otherwise, your pile might fall over from poorly tied ends. Hint number two will save some time as well. Do not stack between trees. Too many piles fall over due to tree movement in the wind. Cover only the top of the stack to allow air flow. There are other methods such as heap piling and circle piles, but still, the best for quick drying is single row stacking. If you stack more than one row, leave a good space between rows for air circulation. There is also no reason that you have to stick to conventional row stacking; use your imagination and create something different, eye-catching, and conversational. A simple online search for firewood stacking will render interesting options to consider. An old and trusted friend my hubby used to cut wood with once said, that you can sometimes judge a man by how well his wood is stacked. Keep it neat, tight and tidy, and remember what your neighbors see when they look over the fence. Burning only dried wood is recommended. Greenwood tends to create more smoke. Keep this in mind as you stack firewood, so you'll be able to easily get at the dryest wood. Also, rotate use and burn the oldest dried wood first to minimize rot. Lastly, there are different types of firewood racks and holders for either indoor or outdoor use, and some find these very convenient. Keeping only a day or two's firewood handy indoors is advised. Firewood is known to bring in some unwanted pests, dirt and bark debris, as well as pollen which can be bad for allergies. And if it's not completely dry, the moisture within the wood can create excess humidity in your home. Enjoy burning wood for heat. It's a comforting heating alternative and depending on firewood costs and availability in your area; it may also reduce your overall heating costs.